You may remember that I participated in the American initiative 30 Days 30 Ways last September. It’s a monthly series of daily challenges designed to be simple tasks to help improve emergency preparedness. This year, colleagues in Northamptonshire have also developed a UK version. Having a local version of the game is great. I found lots of the challenges last year rather difficult and the reason that I gave for this was down to different structures and practices. However, I drew this conclusion with very limited evidence…. As I’m involved in promoting #30Days30WaysUK, and therefore know the list of challenges, it would be a bit of a conflict of interests for me to participate properly. Instead, I’ve set myself the rather impossible challenge of competing tasks from both the UK and USA versions with a view to drawing out similarities and differences. Each day (or as often as I can) I’ll provide my ‘answers’ to both the UK and International challenges. Where I can I’ll also provide trackbacks to my musings last year. Ok, part one is easy, I talk about emergency planning fairly often, although mostly in a work context rather than how I would actually respond myself. Those who know me will have heard about my Zombie Apocalypse bag. In reality it’s more of a series of small packs that I’ve stashed in various locations (not just at home) which have some essential items. There isn’t so much of a grab bag culture in the UK. I think this is largely because we don’t face many of the acute risks that other places do. UK citizens are unlikely to be directly affected by earthquakes, volcanoes or hurricanes, so I’m not convinced that encouraging members they need to be able to live ‘off the grid’ for 3 days would ever have any traction. I do though, think there is merit in having situation dependant grab bags – live in a flood zone, then have a flood kit prepared; driving in the winter, better pack your winter car kit. I despise checklists, especially when it comes to grab bags. There isn’t one bag to rule them all. Each of us need to tailor the contents to specific actual and perceived needs. Many of us pack grab bags on a daily basis – whether it’s children’s school bags or the bags we each take to work. They contain what we think we need to get through the day. If you have a gym bag, it has the necessary items you’ll need for your workout. If you’re pregnant then your grab bag for the hospital contains essentials for mother and baby in the first few hours. A grab bag for emergencies is really no different – some key items that might make the disruption more bearable, but as different emergencies would have different impact I’m not keen on the grab-bag-by-numbers approach. So, whilst I won’t be consolidating my grab bags into one, I’ll stick to maintaining my series of pick’n’mix grab packs! Any tourist that’s been to London in the last 8 years will know that you can’t move for souvenirs plastered with the Keep Calm and Carry On logo. It’s a fantastically simple message, but I thought it was too obvious a choice. 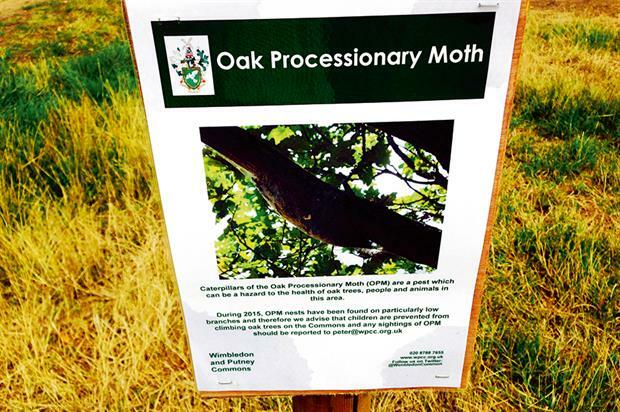 So after some head scratching and googling I opted for this sign taken about 20 mins from where I live, regarding the Oak Processionary Moth. Although recently removed from the London Risk Register this remains my favourite (and by far the cutest) risk I have been involved with! In case it’s not something you’re familiar with, the spines on the caterpillars can aggravate existing respiratory conditions such as asthma, but the little critters can also do damage to oak trees themselves. Day 1 down, just 29 more to go! 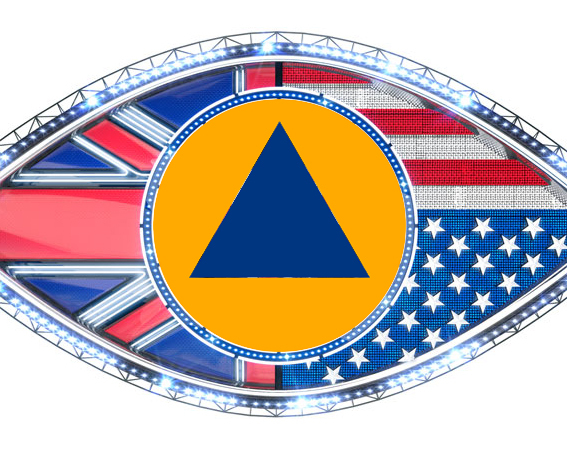 Oh, and the top image is ‘adapted’ from this years Celebrity Big Brother logo. If the big wigs at Endemol don’t like my edits then I’ll remove it, until then I’ll take my chances!